The standard Open dialog box appears; it works like any ordinary Open dialog box that you find in other applications. You can always click one or more photos in the Organizer and click the Editor button to open the selected photos in the Photo Editor. Navigate your hard drive and then select a picture. On your operating system, sample images are typically found in your Pictures folder that’s one of the default folders in both Windows and OS X installations. Select a picture and click Open. You can open as many image windows in Elements as your computer memory can handle. When each new file is opened, a thumbnail image is added to the Photo Bin at the bottom of the workspace. Filenames appear as tabs above the image window. Additionally, photo thumbnails appear in the Photo Bin. To bring a photo forward, click the filename in a tab or double-click a thumbnail in the Photo Bin. To close a photo, click the X adjacent to the filename or choose File → Close. Filename: Appears above the image window for each file open in the Photo Editor. Scroll bars: These become active when you zoom in on an image. You can click the scroll arrows, move the scroll bar, or grab the Hand tool in the Tools panel and drag within the window to move the image. For Mac users: If you don’t see scroll bars on your Finder windows, open the System Preferences by clicking the System Preferences icon on the Dock. In General Preferences, click Always in the Show Scroll Bars section. Magnification box: See at a glance how much you’ve zoomed in or out. Information box: You can choose what information this readout displays by choosing one of the options from the pop-up menu. When you’re working on an image in Elements, you always want to know the physical image size, the image resolution, and the color mode. Regardless of which menu option you select from the status bar, you can quickly glimpse these essential stats by clicking the Information box, which displays a pop-up menu. Click the readout on the status bar to see file information. You can also resize the window by dragging any corner in or out when the image is undocked and not viewed as a tab. Now that you’re familiar with the overall image window, let’s move on to the Information box’s pop-up menu, which enables you to choose what details appear in the Information box. Click the right-pointing arrow to open the menu. Current Selected Layer: This is a new feature in Photoshop Elements 14. When you click a layer in the Layers panel and choose Current Selected Layer, the layer name appears as the readout. 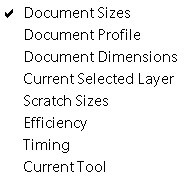 Scratch Sizes: Displays the amount of memory on your hard drive that’s consumed by all documents open in Elements. For example, 20M/200M indicates that the open documents consume 20 megabytes and that a total of 200 megabytes are available for Elements to edit your images. When you add more content to a file, such as new layers, the first figure grows while the second figure remains static. If you find that Elements runs slowly, check your scratch sizes to see whether the complexity of your file is part of the problem. Efficiency: Indicates how many operations you’re performing in RAM, as opposed to using your scratch disk. When the number is 100 percent, you’re working in RAM. When the number drops below 100 percent, you’re using the scratch disk. If you continually work below 100 percent, it’s a good indication that you need to buy more RAM to increase your efficiency. Why is this information important? Suppose you have a great photo you want to add to your Facebook account and you examine the photo to find the physical size of 8 x 10 inches at 300 pixels per inch (ppi). You also find that the saved file size is over 20MB. 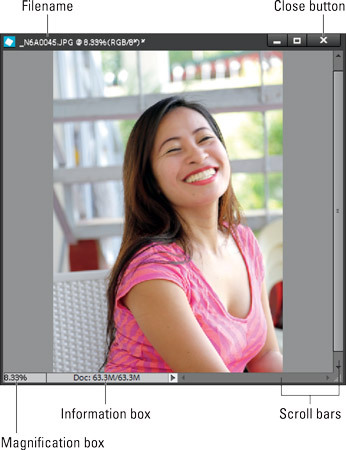 At a quick glance, you know you want to resize or crop the photo to perhaps 4 x 6 inches at 72 ppi. Changing the resolution dramatically reduces the file size.